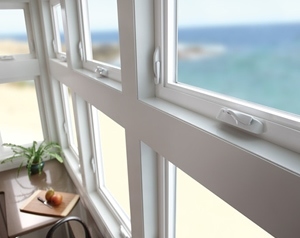 Double-paned windows are based on a relatively simple concept that seems obvious today, but it has only been within the last decade that they have risen into the mainstream. Double-paned windows work by using two panes of glass, separated by a small gap that is filled with an insulating gas denser than regular air—slowing the rate of heat transfer into or out of your home. Single-paned windows are exactly what the name implies—single-paned. Single-paned windows have a single pane of glass that separates the interior of your home from the exterior. To get a sense of how poorly single-paned windows insulate your home, touch your windows on an exceptionally warm or cold day. The glass—and even the area around the glass—will be hot or cold to the touch. This causes the glass to heat or cool the air adjacent to the window, raising or lowering the temperature in the room. Since glass is so ineffective against reducing heat transfer, this makes your windows highly efficient at transferring heat into and out of your homes—making it difficult to maintain consistent temperatures, which increases your heating and cooling costs. For years, this was of little concern because energy costs were relatively low and the laws of thermodynamics were not well understood. In the past twenty years, however, energy costs have risen significantly, as has awareness for environmental responsibility. This gave rise to a new market segment focused on reducing the amount of energy lost from through windows. If you were to touch a double-paned window, you would notice a stark contrast to the temperature outside. This is because the insulating layer of gas in between the two panes of glass is helping moderate the amount of heat that transfers into or out of your home. This helps to regulate the temperature—making your home more comfortable and less costly to heat or cool.